Maybe if you print that sign in bulk you could get a discount. I bet there are other people *coughcough* who are similarly afflicted. I have a sudden and unexpected love for those big old machines. Every young girl needs a typewriter and a diary with a lock. The combination can be dangerous (eventually), but making girls into writers is a loving, risk-taking business. What a marvelous gift. I'll bet you get something impressive for Father's Day, mister. It's an inconvenient love for sure Duffy, as you can appreciate how really beefy these things are compared to portables. (Wife's comment on seeing the Royal: "My God, it's HUGE!") They type like nothing else, though. I spent a few summers home from school in an administrative job which involved using a Selectric II for various about-the-office tasks. That thing scared me -- all the humming and the rapid-fire deployment of the type-ball. 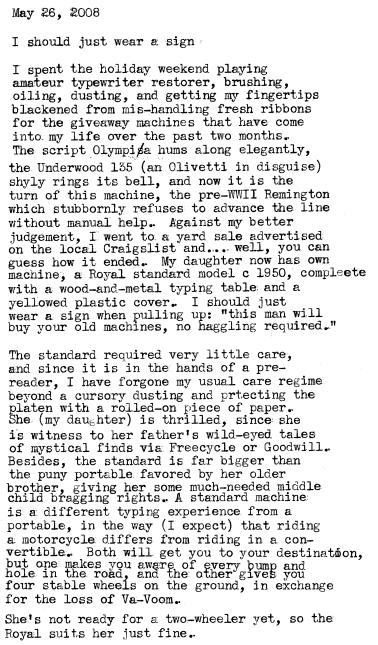 Only through serious Underwood and Royal therapy have I been able to look back at desktop machines with anything less than fear. Monda, I never thought of that. 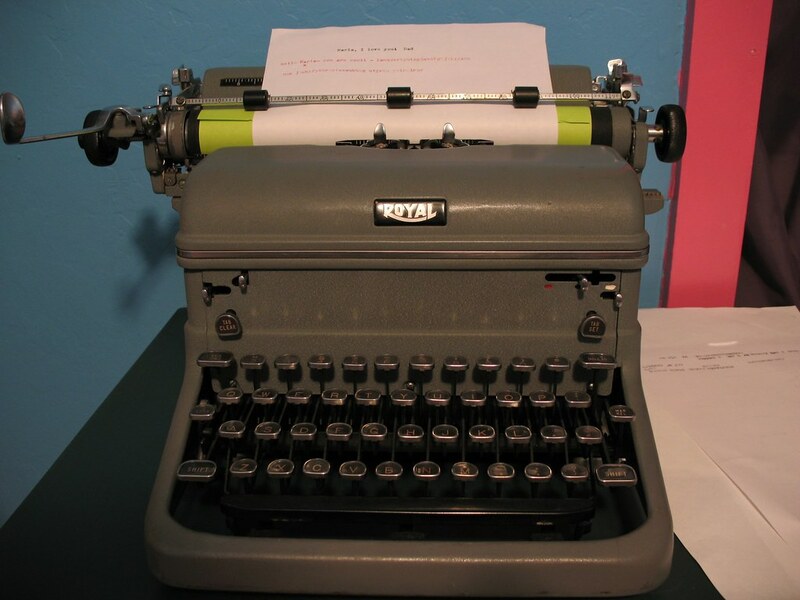 She *is* growing up, and what better companion for young lady of distinction than a fine writing machine. She's quite the book-lover already. Does it count if it's free?